Hi everyone! I am so excited about this post! I have been working on Aubrey's nursery and I had to share this dresser redo that I did this weekend. I knew I wanted a french provincial dresser for her nursery and I had been checking Craigslist every few days for the perfect one. Most were exactly what I was looking for, but with the usual hefty price tag of around $300....way out of my budget. I was psyched when I saw a listing with NO PICTURE for only $75. I emailed the lady a picture of the type of dresser I was looking for and she said it looked like that. Well, we got in the car and made the almost hour long hike to look at it. We don't mind the long haul's since we have gotten so many great deals on Craigslist because we went further. When we got there and I first saw the dresser, I squealed. No need for negotiating with the $75 price tag so I gladly handed over my money. We loaded it in the truck and I was so excited...I knew exactly how I wanted to refinish it! After a couple of weeks I had finally found the "perfect" two colors for the dresser. Those who know me know that I am SUPER PICKY when it comes to paint colors. Down to the slightest hue difference. Luckily, I nailed this one! I went with Benjamin Moore - Orchid Pink (036) for the dresser. I used Sherwin Williams- Super Paint in Semi Gloss. & for the gold, I used Design Master in 24kt Pure Gold. I wiped the dresser down with Lysol wipes to get any gunk or residue that may have built up over the years. Sand. I used a sanding block and went over all of the surfaces to slightly rough it up. I wanted to avoid priming on this project (I know..). My dad used his electric sander to get the top surface really well. Spray paint the hardware. I took them all off and put them in a cardboard box. Spray away! Paint!! I did two coats of the Super Paint in Orchid Pink. I waited about 4 hours in between coats to make sure it was dry. Looks great, doesn't it?! This is when its tempting to stop. It looked good already, why keep going? Because I knew it was about to look even better!! I can't even tell you how IN LOVE I am with this dresser. It is going to look amazing in her nursery! Check out the after shots below!!! Manda: You have such great taste your house and your items are so beautiful!! The dresser for the babies room is exactly like the one I had when I lived at my parents when I was a teen!! My set also had another 3 drawer dresser with a hutch! It is Identical! Thank you Melanie!! The lady I bought it from was also selling the other piece you're talking about, but we didn't have room in the nursery for it. I love the shape and detail on the dresser though! This turned out beautiful!! I love it! I love her nursery! I ordered the same wallpaper for our baby girl's nursery. I picked up a swatch of the Benjamin Moore Orchid pink and it doesn't look very pink. Just to clarify, you did two coats of that color, right? There are so many pink options! Thanks! I didn't think it looked very pink either, but it is PLENTY pink! It's perfect! I did two, three coats in some places. I wanted it heavier on the top to hold up to use better. Beautiful! 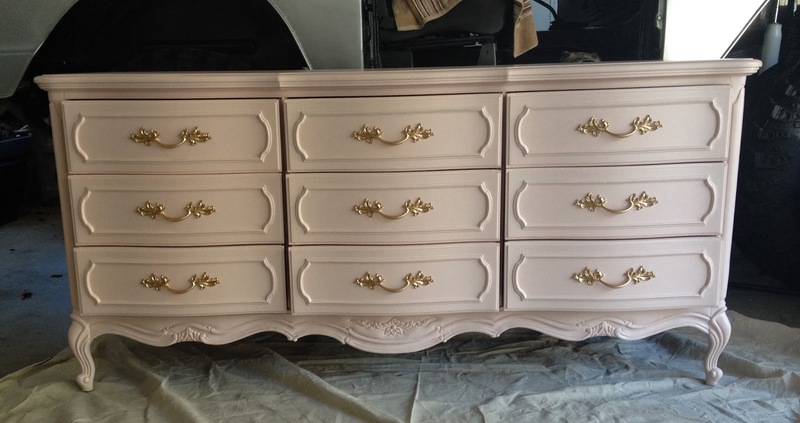 I want to paint my daughter's dresser like this. Did you use a brush or foam roller for the pink? Also, did you finish it wish a wax rub or other sealer to avoid the paint from scratching off? Thanks! I used a brush for the drawers since they had the detailing on them and a foam roller for the top and sides of the dresser. I sanded the surface well so the paint would adhere. Because I used Semi-Gloss, no sealer is required. The surface will be durable and wipe able like the doors and molding in your home. Just make sure to let the paint fully cure before heavy use. Just found this dresser on Pinterest and had to check out who did it. GREAT JOB!!! Love it! Thank you so much Loribeth! Hi Amanda, Beautiful job on the dresser, love it! Just wondering how the Design Master 14K gold metallic spray has held up. I did a similar project using a different brand of gold spray and it didn't hold up very well at all... so before I try this again, can you do a wear 'n tear "update" of the gold-dipped area? Thanks so much! Thanks for checking in! The spray still looks like it did on day one except for one of the metal handles which has just dulled a bit. That was probably from poor prepping on my part though. I didn't do any prep work to the handles, just to the dipped part of the dresser. Just curious about the paint on the dresser because you list 2..the benjamin moore and then sherwin williams so that confused me! I also just bought a dresser just like this from Craigslist and was disappointed to find that it is not solid wood. Was yours? Mine has a lot of plastic/laminate so I am trying to figure out which direction to go as far as sanding/priming/painting OR using chalk paint. I am in LOVE with the way yours turned out and am hoping to recreate it myself!